Sorry this is out a bit later than I was wanting! I have been super busy the last couple weeks and this weekend I hit a wall (and went a bit crazy) and realized I have got to slow down a bit! So, this week I’m planning VERY little and just going to mainly have a home week! I’m super excited for this week too, because my oldest sister and her kids are moving back to Southern Utah! They’ve been living in ND that last year, but decided it would be better for them to return near family! We are all excited to have them back! So, here is the 4th of July Pre-K Pack! I was super happy with the clipart and think it turned out fun! I hope that you and your little ones enjoy it! 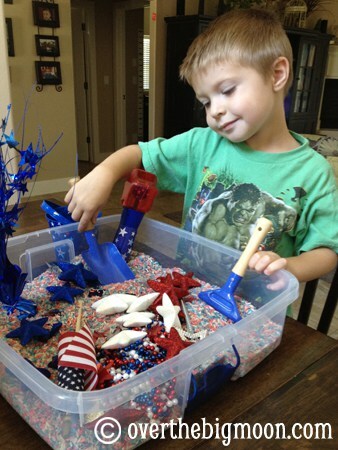 My boys have also been having some fun playing in the 4th of July Sensory Bin I put together! They always love sensory bins! To see some more fun 4th of July crafts (and decoration) ideas go check out my 4th of July Pinterest Board! Pixel Paper Prints or the Boy and Girl 4th of July Clipart and to http://us-flag.net/pictures/coloring-page! I LOVE this idea! I can’t wait until my son is old enough to do these! Thanks Ladies! Thank you!! My son will love these! So cute! I can’t wait to print them ALL! Anywho! THANK YOU! Your printables are the only ones where I literally print EVERY page. I’m delighted! Love it! My fave pages are the what comes next and the sizing. We are working on cutting at the moment.